Pachinko Wizard (Egg Drop in PAL regions) is a General minigame from Mario Party: Island Tour. Purple Toad and Yellow Toad are inside a pachinko machine. A Lakitu throws a Spiny Egg down the pachinko machine though it doesn't hit anybody before cutting to the players. This is a luck-based minigame. The players must choose the pachinko slot they think is the safest. 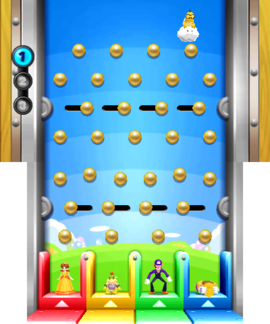 A Lakitu will drop a Spiny Egg down the machine, and the player in the slot the Spiny falls into will be eliminated. The process continues until there is only one player remaining. / / / – Choose slot. Rules – NTSC "Try to guess where Lakitu's Spiny Egg will fall, and choose a safe place to stand." Rules – PAL "Try to pick a spot where Lakitu's Spiny Eggs won't hit you!" Spanish ¡A cubierto! Take cover!